One time or the other, we download some sort of software either from a software download website like download.com (which is not good) or from the developer website and not sure if the download is clean. i.e, safe to install or run. In those situations, it is better to test the software before installing or use it. Previously, you have to use a dedicated sandbox software like Sandboxie or fire up a full-fledged virtual machine using powerful and resource hungry virtualization software like VMware or VirtualBox. But, that is no longer the case. Windows 10 now has a built-in sandbox that is lightweight and works perfectly. The sandbox feature on Windows 10 is perfect to test software, access potentially harmful websites, etc. 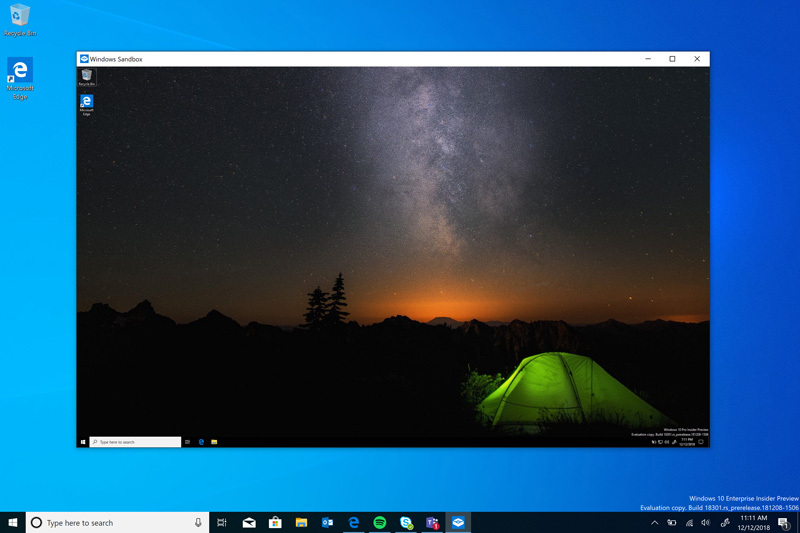 Since the sandbox is essentially a lightweight Windows 10 environment, you can use it as your regular Windows 10 system. Anything you do in the sandbox has no effect on your regular Windows 10 installation. In case you don't know, Microsoft also added the sandbox feature to Windows Defender so that it can better scan and protect your system from malware, virus and other threats. Without ado, let me show you how to enable sandbox on Windows 10. 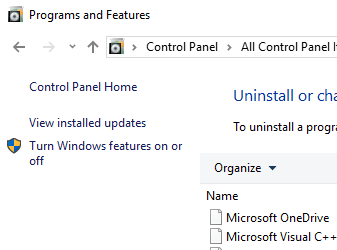 Before you can enable and use sandbox feature on Windows 10, your system should have or support the following. The requirements listed below are very common. If you bought a computer in the last couple of years, your system should be good to go. But it is better to check twice before trying to enable sandbox feature on Windows 10. 2. Your system should support virtualization. If you are not sure, download this software and execute the .exe file. It will instantly tell if your system supports hardware virtualization or not. If hardware virtualization is supported, you will see "Yes" on top of "Hardware Virtualization". Conveniently, the software also tells whether you are running a 32-bit or 64-bit version of Windows. 3. Your system should have at least 4GB memory (RAM). It is recommended to have 8GB for a smooth experience. 4. Should have at least 1GB of free space. This space is used by the sandbox. Follow this and this article to free up some space. 5. You should be running Windows 10 build 18305 or higher or version 1903. If you are unsure, you can easily check your Windows 10 version number. Once you've confirmed you meet all the above requirements, proceed to enable sandbox on Windows 10. Note: If any of the above requirements didn't meet, you will either not see the "Windows Sandbox" option or it will be greyed out so that you cannot enable it. 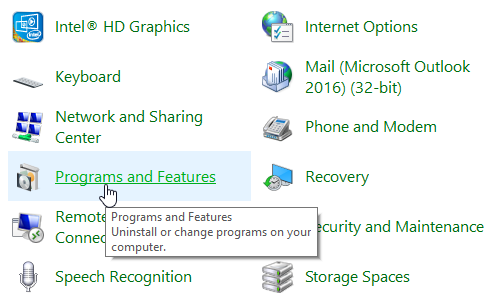 Find "Programs and Features" option and click on it. Click on the "Turn Windows Features On or Off" link on the sidebar. In the new window, scroll down and select the checkbox next to "Windows Sandbox". Windows will automatically make the necessary changes. Click on the "Restart" button in the last window. That is it, you've enabled sandbox feature on Windows 10. After restarting, you can start using it by searching for "Windows Sandbox" in the start menu. Disabling sandbox feature on Windows 10 is as easy as enabling it. 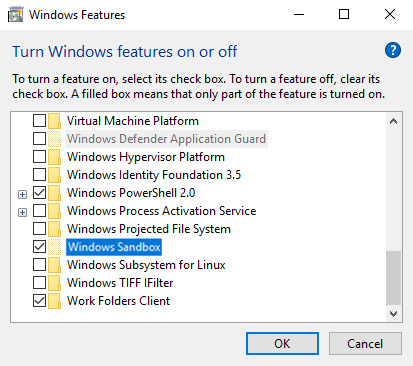 To disable sandbox on Windows 10, deselect the "Windows Sandbox" checkbox you select earlier in step 5 and restart your system. After restarting, the sandbox will be disabled and you will no longer be able to access it. If you like this article, do check out how to remove 3d objects folder from file explorer on Windows 10.